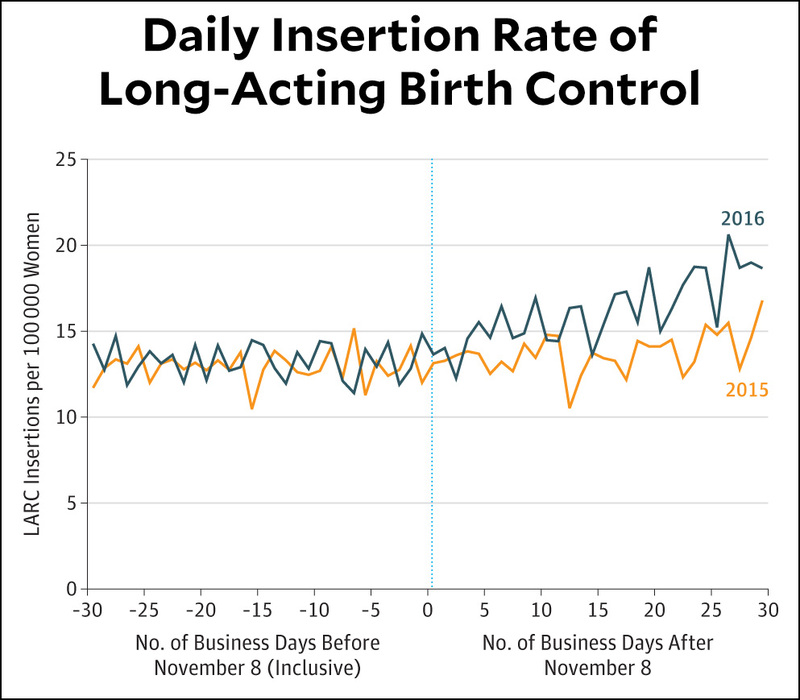 In 2015, the mean adjusted daily LARC [long-acting reversible contraception] insertion rate during the 30 business days before and inclusive of November 8 was 12.9 per 100 000 women vs 13.7 per 100 000 women during the subsequent 30 business days. The comparable mean adjusted daily LARC insertion rates before and after the 2016 presidential election were 13.4 per 100 000 women and 16.3 per 100 000 women, an increase of 21.6%. Many women decided they didn’t want to raise children in a country that could elect Donald Trump president. Women were afraid of a Handmaid’s Tale hellscape coming and wanted to prepare. Women were afraid Trump would kill off Obamacare, so they wanted to get their LARC inserted for free while they could.